This article first appeared in City & Country, The Edge Malaysia Weekly, on April 1, 2019 - April 07, 2019. On a hot and sunny Tuesday morning, 39 participants from Rehda Youth walked into the foyer of the Gamuda IBS Sepang factory. Their visit was to learn about the benefits and practical aspects of the Industrialised Building System (IBS) — which involves manufacturing building components in a factory, for example, and then transporting them to a construction site for assembly. According to organising chairman and Rehda Youth secretary Ng Choon Keith, “IBS has been in Malaysia for 10 to 15 years, and for Gamuda to pioneer this factory is commendable. Many systems are being designed and engineered, but no developer has really embraced IBS like Gamuda. According to Gamuda Industrial Building System Sdn Bhd general manager Tan Ek Khai, digital IBS will take the construction industry to a new level. 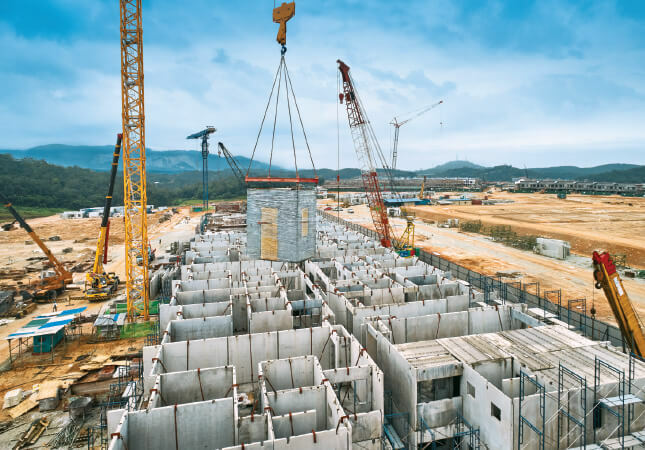 “The next phase of growth for construction is in this sector, where digital design tools such as building information modelling (BIM), coupled with robotics construction, will drive the industry in a vertically integrated value chain. Gamuda IBS Sepang sits on 27 acres of land. It was followed by a 66-acre factory in Banting that was completed in end-2018. Both factories combined will generate a total capacity of 10,000 units and 16,000 bathroom pods annually. Residences at twentyfive.7 in Kota Kemuning with 500 units while the landed properties will be in Gamuda Cove in southern Klang Valley with 490 units. A briefing on the benefits of using the digital IBS system was held before the tour commenced. It explained the shared digital ecosystem where the product design is done via BIM, and the information is then distributed to robots in the factory to manufacture the components needed. The process then follows with labelled components being delivered to the construction site and, like Lego, put together for the final product. It is a time-saving construction method. According to Gamuda, the system allows for three projects to be completed compared with two projects using conventional methods and time frame. This system also mitigates delays and reduces the need for foreign labour while ensuring that quality is maintained throughout the construction process. Moreover, it creates less wastage, increases safety and keeps the construction site clean and uncluttered. One of the participants asked about the cost of manufacturing, to which the response was that it costs about 6% more to produce, however, because a building can be erected faster, the cost saved in time will even out eventually. After the briefing, participants were given reflective vests and purple hard hats — Gamuda’s official dress code for visitors to the factory. The purple colour serves to signify that visitors are given priority in case of an emergency. 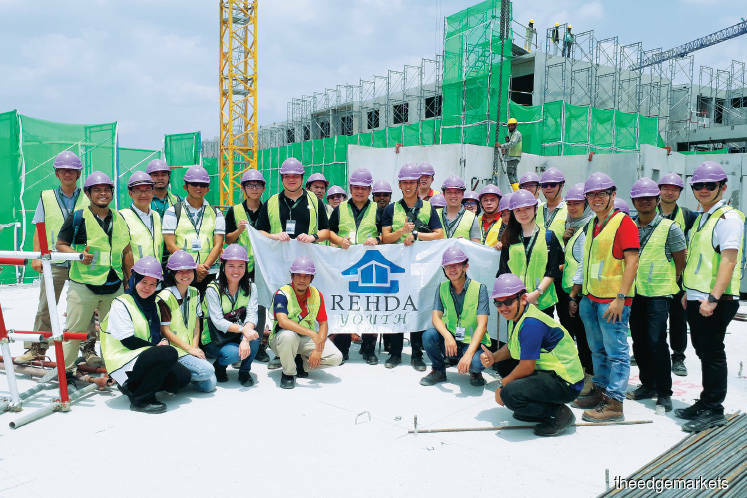 Rehda Youth’s first stop on the tour was a factory station dedicated to the creation of moulds into which concrete is poured to create the wall panels. Here, a robot picks up bars, or shutters as they are called, and places them on a large stainless steel plate. The shutters are magnetised to the plate and sections that are not blocked by the shutters will be done manually with polystyrene blocks. The plate then moves on to different stations where machines and labourers work together to produce smooth wall panels, which once ready are then sent to the construction site to be assembled. What stood out was how clean the factory floors were and also how systematic everything looked. There was a section where the wall panels were smoothed by a fan-like contraption, and we were told that once the walls are installed, a skim coat is applied before painting. Hence, there is no need for plastering. The factory also manufactures bathroom pods with pre-installed fittings, which are plug-and-play worthy once the pods are delivered to the construction site. After the factory tour, participants then visited the show units — a 1-storey bare unit and a 2-storey furnished house — and realised that the product was visually identical to those built conventionally. To the question about renovation, that would have been taken into account from the design stage, and any repairs, say for electrical wiring, can be done as notches and pipes have been installed to allow for wires to be pulled through without any hacking. Gamuda has been using the IBS system for most of its own projects although the factories can be engaged by external clients. One such project is the RM125 million Rumah Selangorku (RSKU) Pangaspuri Gapura Bayu in Jade Hills, Kajang that was structurally completed within 12 months. It offers 714 units with built-ups of 650 or 1,100 sq ft across three towers. Another RSKU project is Idaman Residensi in Cyberjaya, where panels are being installed at the moment and should be completed by July this year. Upon completion, the two towers will comprise 864 units of about 1,000 sq ft each. Other Gamuda projects include one in Kundang, Selangor, where the installation took five months and features a single tower with 230 units with built-ups of 750 to 1,000 sq ft.
To install the panels, Gamuda will provide labourers to ensure that it is done correctly. However, the company has also trained subcontractors to do the fitting properly. It is hoped that over time, with economies of scale, the cost of manufacturing will reduce and it will be common practice in Malaysia to use IBS. As the tour concluded, several participants shared their takeaways from this learning experience. “I am very glad that there is a developer and contractor that is taking the initiative to bring the construction industry to a new level,” says one. Another believes that “IBS will bring a new era to the industry. I believe that it will bring a lot of benefit, especially on workmanship and time-saving”.